Trevor Pateman's Philately Blog: Soviet and Post Soviet Covers ... What Do You Think of These? 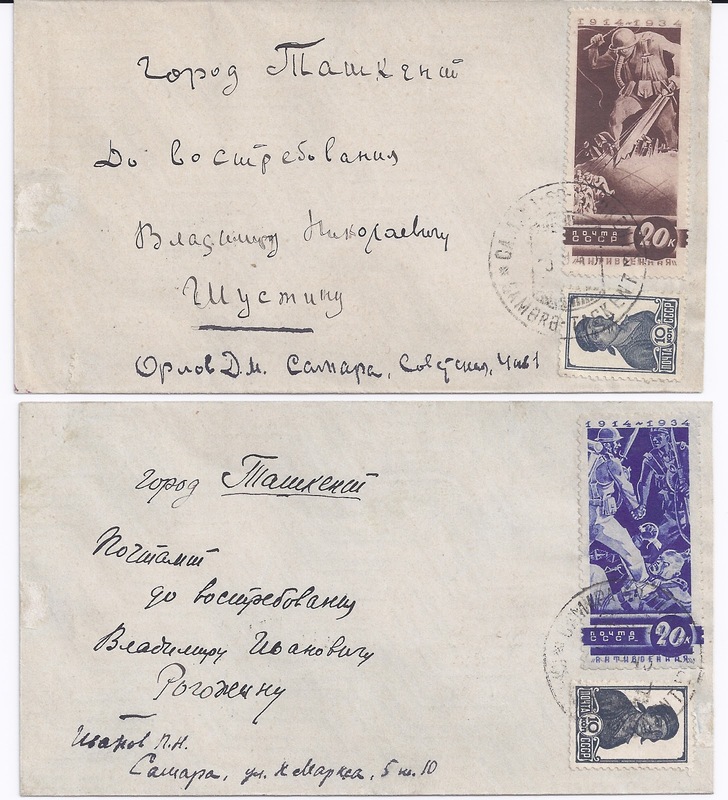 Soviet and Post Soviet Covers ... What Do You Think of These? 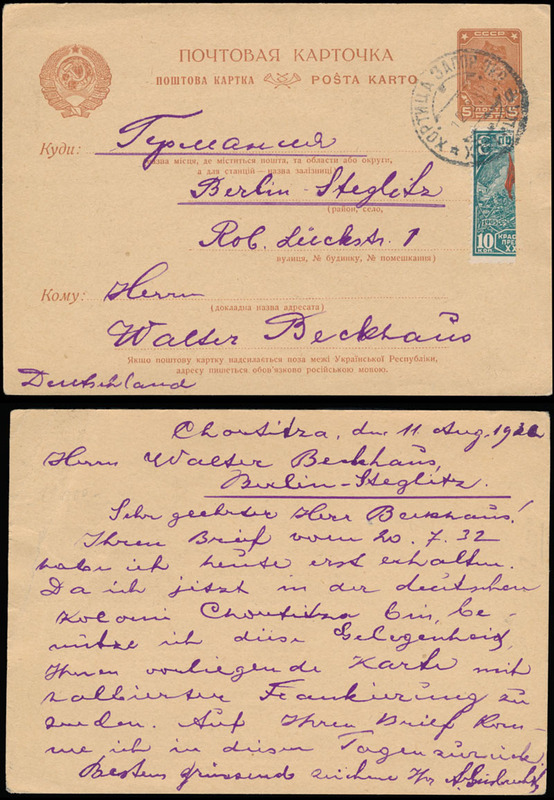 (1) On this first card, the bisected stamp does contribute the necessary 5 kopecks to make up the 10 kopeck postcard rate of 1 June 1931. 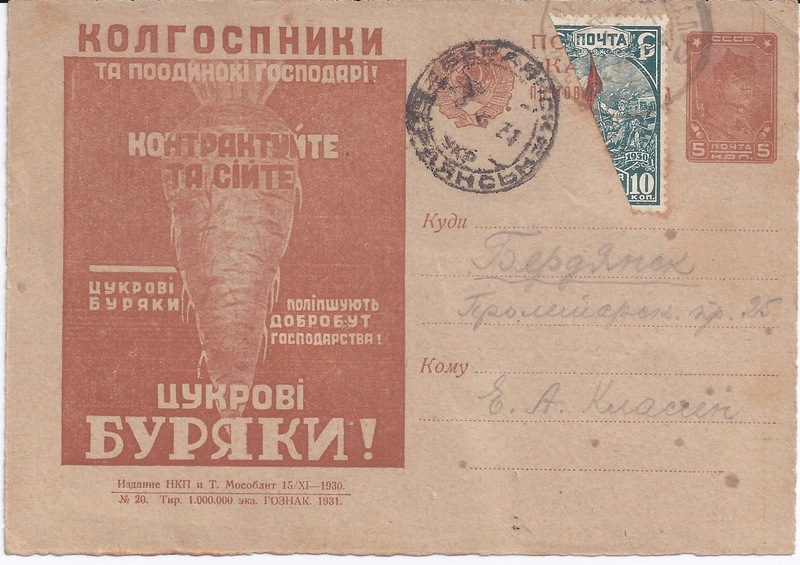 The card was posted at ALEXANDROV VOKSAL 1 8 31 and arrived at BERDYANSK 3 8 31. 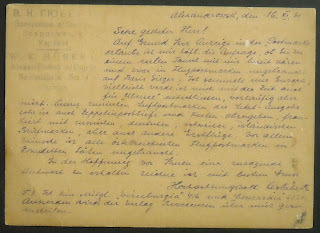 There is a long family message in German on the back but at the end the sender writes, " Diese Karte bitte züruck" - Please send this card back (and underlined). So the sender knew that the card was philatelically interesting and maybe was responsible for the bisect. However, when this card was illustrated in The Post Rider in November 1998, Andrew Cronin commented that another bisect is known from the same region [ Added: See now below]. If the sender is not the same person, then the bisect may be non-philatelic but recognised by the sender as philatelically important. The fact that the post office clerk has cancelled the bisect carelessly does suggest that the clerk did not think of this card as philatelic. And another things I have just noticed: the pencil used for the "Please send this card back" is not the same pencil as was used to write the long message! The sender added it later ... So is this card worth 10 € or 1000 € ? Comments? 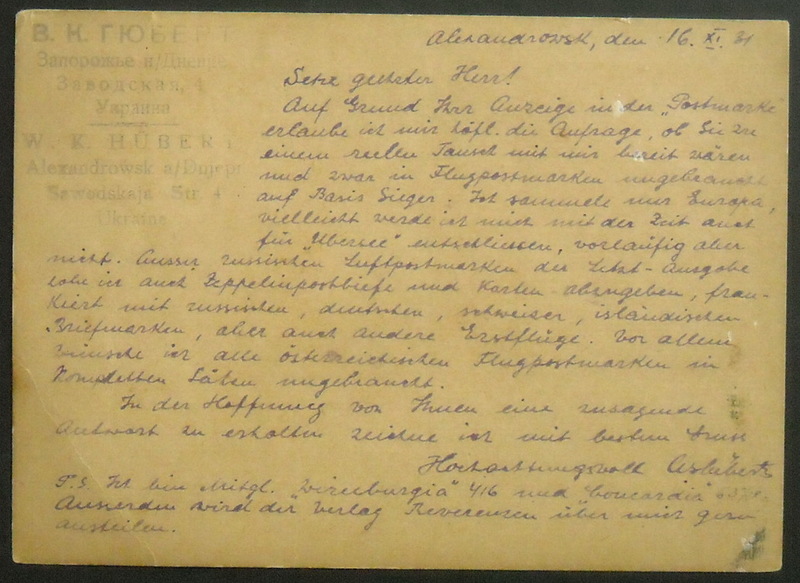 Added: Vasilis Opsimos has copied me the Andrew Cronin article from The Post Rider 1998 which gives the date of first known use as 17 7 31 from Khortytsa when a card with a bisect was sent to the German stamp dealers and catalogue makers, Senf, in Leipzig. They announced the local bisect in the German philatelic press. We do not have an illustration of this card. Cronin does illustrate a card from KHORTYTSA 3 2 32 to Kiev, and translates the Russian message which makes reference to the bisect. 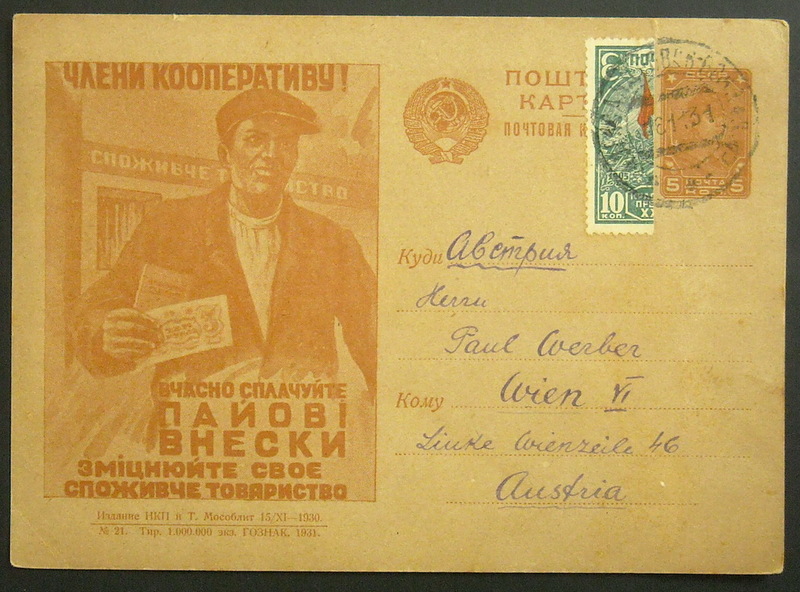 Opsimos copied me the following images of a card sold on ebay (for $355) and going from ALEXANDROVSK VOKSAL 18 11 31 to Vienna. This card is also from a philatelist. 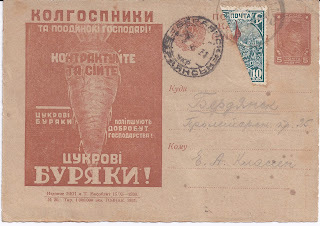 So in total we now have 5 recorded cards, all with bisects of the 1905 Revolution commemoration 10 kopeck. Two are internal uses, two are used to Germany and one to Austria (inland and foreign Tariffs were the same). Three are written in German and one in Russian. Three are from Khortytsa and two from Alexandrov Voksal. The period of use is just over a year. 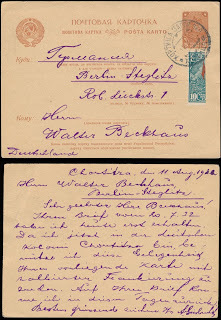 The message on the Raritan card with the use of the word "Gelegenheit" [Opportunity]strongly suggests these cards were linked to the German colony of Khortytsa and may have had their origins as a local post office provisional in July 1931, even if they were then sought out by philatelists. It may be relevant that at this time travelling in Ukraine would not have been a straightforward matter. 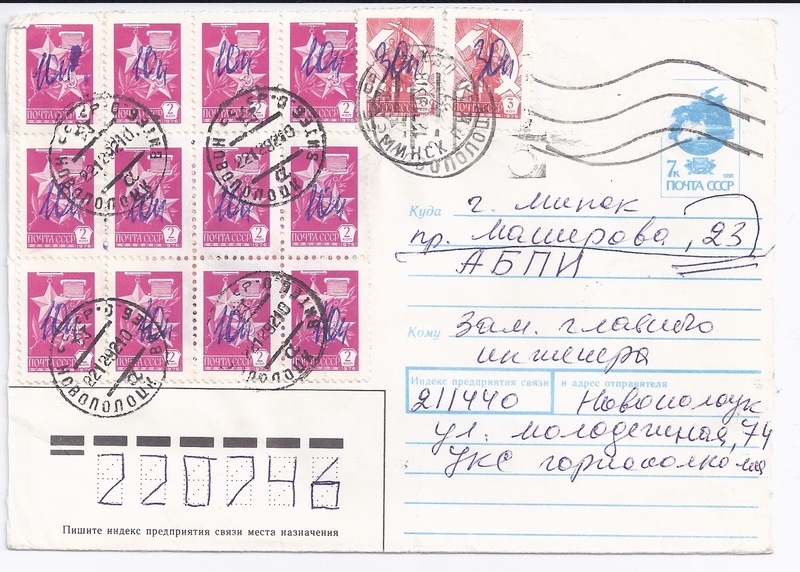 (3) Finally, a post-Soviet example of an interesting but frustrating 1992 Belarus cover. Here the address and the sender's address suggest that this is non-philatelic (no Box Numbers, as one so often sees on philatelic confections of this period). 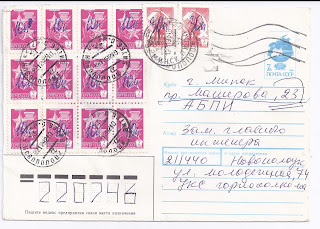 But are these Manuscript revaluations the work of the NOVO POLOTSK VITEB[sk] 22 12 92 post office? That question can only really be answered YES if you can find other examples of these revaluations going to other addresses from other senders. Does anyone have an example?